This entry is a post from the diary of my mother, twenty year old Eileen KINNICK, 75 Years Ago this date. 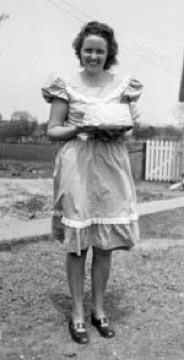 She kept a diary from 1932 as a freshman in high school until she left us, too early, in 1999. Rained real nice several times during day. Did up usual work. Made an angel food. Ate dinner. Pete went in town in pm & got his haircut. Home and he helped me clean the house. Washed my hair. Pete chored early. Leo & Ida came & we all were in at folks' for supper. Did dishes & went down town. Sat on Main St. for long time. Home at 11:00.